“Writing is a solitary exercise”- Professor Jean Jacques Sene (2017). It takes great discipline, commitment and dedication to sit down to solely focus on putting one’s thoughts on a piece of a paper. Sizwe Mpofu Walsh should be commended for the work he has done in the Democracy and Delusion, and it is amazing how the book have fared commercially. It shows that as a country we are moving towards the right direction in regard of reading and appreciation of literature. Let me correct, the country is reclaiming its rightful place in literature per books and arts, what a time to be alive! Sporadic historical moments, from Rhodes bust falling to fees must fall ! have they fallen? Anyway let’s look into one of the fallists who found himself at the pulse of a historical moment in Oxford. It must be said that the Oxford Rhodes Must Fall Campaign brought the necessary nuisance to the inherently racist institution and ruffled the feathers of orthodoxy and Rhodes aristocracy. Sizwe Mpofu Walsh together with fellow brilliant migrant students, shook murderers like Frederik Willem De Klerk out of their wits and dominated the narrative at the colonialist’ doorstep. I can imagine one Oxfordian “What do we have here? These ungrateful bunch of spoilt Afrikans” Dambudzo should be having a wry smile or seething with skepticism in his grave up north. I am bringing all of these things because one got to know the author’s ideas through his involvement in Oxford Rhodes Must Fall. Myth Ten: South Africa has Reckoned with Marikana. 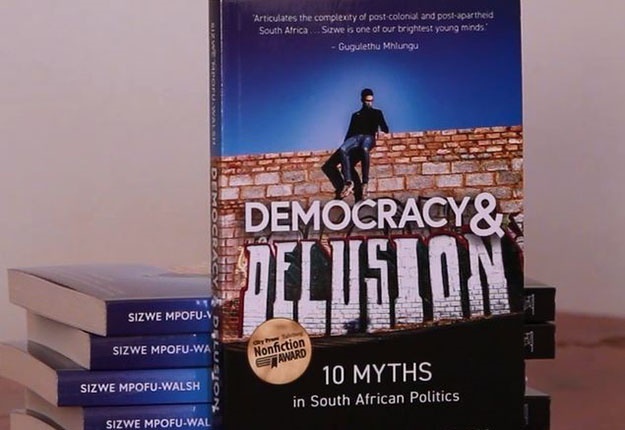 Democracy and Delusion is a book that attempts to narrate, diagnose and suggest the post – Codesa sacrifice of 1990s negotiations in Kempton Park. It clearly reflects the outlook, ideological posture and academic background of the author. Firstly the essays are themed under provocative themes and it was deliberate because Sizwe did confess that he wanted to provoke and solicit the much needed conversation or dialogue per issues in his book. For that the book should be commended and for introducing some of us to the ideas and outlook of the author on issues. Sizwe concludes his introduction to the book by saying “I hope you will suspend outrage long enough to give it a fair hearing” I had to think deeply of the implications of that, thus I took days to finish it. The book reads like an academic series in novel garb while pricking the sensitivities of the liberal bloc at the same time massaging the status quo, I say “confusion” The book suspend and negate the dominant ideological posture of our socio-economic trajectory. It cannot probe and debunk the dominant “myths” without locating the genesis of the prevailing socio-economic issues. I think what comes out strongly in this book is the deliberate antagonism towards liberation ideological posture. Here is the contradiction the book draws significant inspiration from economics, makes reference to the law and the Kliptown Charter. I think the esteemed Sizwe Mpofu Walsh is a charterist, as it can be seen where one see “freedom charter” littered across the rap verses and pages. Truly there is no problem with one appreciating certain ideo-political posture. The issue is denial of one’s position. Enough about ideological posture or orientation of the book, it’s quite evident it was deliberate act to negate the importance of ideology in the post-codesa sacrifice. Now let me briefly input on several chapters, I believe you will go out of your way to get the book and “give fair hearing” to it. I was stunned by Myth two: Free Education is Unachievable, don’t get me wrong I partially agree with the proposition on the chapter because of my neo liberal economics background. It’s a known fact that South African parastatals are ineffective and have wasted billions of rands, which could have been used for the education prioritization. I am at odds with the “international standards” or juxtaposition to other countries, because often we tend to neglect the unique socio-politic and socio-economic history of our country. The urgency to always agitate and revert back to the central issue of conflict in dealing with inherent challenges in the current epoch. Nevertheless there are things that I feel have been omitted or totally set aside in this chapter, which is seen across the whole book namely “Afrikan Centred Education” and “Decolonization” As often said by khongolose charters “It cannot be correct” that we debunk the notion of free education is unachievable without the emphasis of alternative to this dehumanizing and alienating education system. The alternative has always been “Afrikan Socialist Education” and its omission or lack of reference it brings numerous questions to the fore. The issue of education cannot be reduced solely to financial terms without the discussion of the content of the education advocated for to be free. Education cannot be devoid of ideology, epistemology and pedagogy. If the unfortunate occur, and our education is devoid of the latter, then we are at the mercy of Capitalism as it is evident in our time. I find it hard to ignore or to be ignorant to the dominant ideas and its concomitant implications in the socio-economic trajectory of our society. Well the chapter outraged me and it’s still within the confines of capitalism, nothing new. Another chapter of interest is Myth Three: Land Reform Threatens Stability I quickly combed past two chapters of the book, to get to the chapter on Land. This is the chapter for me that generally convinced me the book was nothing but what I call “provocateur text” with no substance to deliver us to liberation and locate historical issue of conflict. 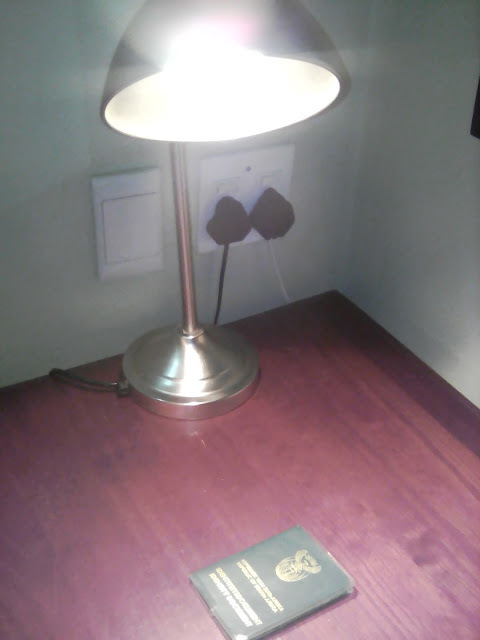 Our brother Sizwe said “this book is weapon young people can use” I am not quite convinced by that this far. Shockingly goes on to say: “The ultimate remedy must involve both the state and individuals, accordance with the dictates of the law and justice” These excerpts acknowledge and justify theft! This is my ire with this chapter! Contradictions contradictions….Sizwe cannot identify a crime and prescribe a remedy that involves “law” knowing very well the implications of “sunset clause”. I think he is treading careful not to raise alarm and offend settlers or thieves of our Land. I had hoped he will say all the national policies have failed, thus the only available option is the return of Land without compensation, Qha! I think other chapters of the book present an interesting outlook and its worth a reading. Get the book! In conclusion I think there are issues that always come up when you read Democracy and Delusion, one there is an intense antagonism towards Afrikan National Congress. Its understandable taking to consideration the deterioration of the once glorified movement and unfortunately put the blame on it for the socio-economic chaos in the country. It doesn’t blame Capitalism or land dispossession for all the identified crises and issues. It comes across as an academic text with significant statistics references to substantiate points. And uses predominantly neoliberal economic models and posture to solve our prevailing issues. Nevertheless I think the chapters I discussed where the main chapters I found provocative. If I have to deal with every chapter of the book you will not buy the book, Sizwe is not yet ready for Nationalization so I will highly recommend that you go grab the book and make up your mind. Democracy and Delusion by Sizwe Mpofu Walsh. It’s either we demystify the book or let it find expression as it is. It’s your choice! Get the book!